They’re offended. They’ve got a problem. They’re using exclamation points. The longer Occupy Wall Street, and its nationwide inspired clones, continue their protests, the more vociferous the right’s opposition is getting. The Tea Party just does not get the Occupy movement. They don’t get that it is an actual grassroots movement, in the dirt, at the root level, and not the grass of a manicured, suburban lawn, cared for by gardeners who have been hired by big banks and John Birchers like the Koch brothers. It only makes sense that in trying to voice opposition to Occupy, the radical right has resorted to categorizing the participants in anarchistic memes. “[W]atch us keep owning Teamsters and Hippies,” invites one right wing video website. “Whenever I hear somebody call me a hippy, I just write it off as ignorance, because that’s a term that’s no longer relevant,” said Kate, an Atlanta teacher and community organizer, who spent Thursday evening helping feed those camping at Occupy Atlanta, in Woodruff Park, in the heart of the city’s downtown business district. 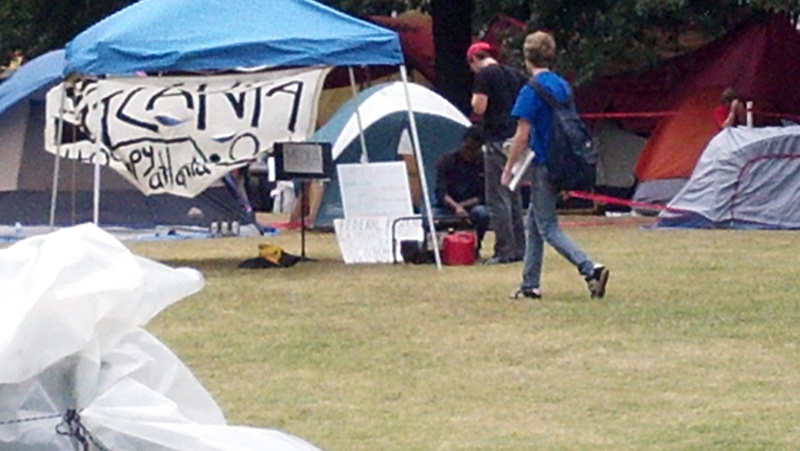 A young web designer at the Occupy Atlanta site, named Ginsen, seemed to agree. “Overall, I support any sort of passion for people to change something they don’t believe is right,” she said, after setting aside the Hula Hoop she had been swaying around in. Harrison Schultz, an activist participating in Occupy Wall Street, told Politico much the same thing. “This is not a political movement, this is a social movement,” he said. But the Tea Party groups see the politics as proof of their power, particularly after the 2010 Congressional elections. “Occupy Wall Street may someday become a significant force in American politics, but they’re certainly not today,” said Mark Meckler, co-founder of the Tea Party Patriots, according to the Politico article. "C'mon. Do we look like union organizers?" And while Ryun doesn’t seem to take the Occupy protesters seriously, the more strident Tea Party Express had a different characterization of the Americans participating in the Occupy movement. “They are a disorganized unruly mob of shiftless protestors that has been reinforced by union and organized labor thugs,” said Amy Kremer, in her letter to supporters, asking for donations. PG, I think what confuses me the most about these Occupy Wall Street types is their ignorance or disdane of the processes our society has in place for discourse. I am not concerned about the lack of coherence or unity of message. I am perplexed by the notion that illegally occupying government or private property would acheive anything within our system. For instance, if “Corporate Greed” (whatever that is) is an issue for people, why camp out, assymble, shout, hold signs or anything. Why not meet with your congressman or buy a few shares in a company and put your voice in at a shareholders meeting? Breaking the law, even a loitering or tresspass law, is disrespectful, futile and more importantly to many, a symbolic gesture of how important the rule of law is to the individual or group breaking the law. In our great country, we have many ways to express ourself and affect change, without breaking the law. In lawless countries, their is civil war. In autocracies, one might see mob or majority rule. In our country, we have systems in place for change. A legislative branch, local governments, constitutional amendments, freedom to leagally assymble. Is the purpose of the “Occupy” movement, to bring down our government, social and business institutions? Wow, AT, so many points to cover. Civil disobedience has been an instrument of change in this country for more than a century, and was certainly the favorite method of the civil rights movement. It’s a way to get people’s attention to the dissatisfaction of a clear majority of the public. The Tea Party got attention by yelling and refusing to allow their representatives to speak at public meetings, and by carrying guns to political rallies. Who poses a more violent threat? As for taking it to the legislative process, one of the main point of the protesters is that our system has been degraded to the point where, unless you’re a wealthy corporate contributer, all you’ll get is a smile and a nod, and maybe a rote excuse as to why they are doing it their way – talking points that show they aren’t really listening. This is not a revolution. It is a wakeup call that voters are fed up with the classism of an ever expnding wage gap, and the government system that supports it.